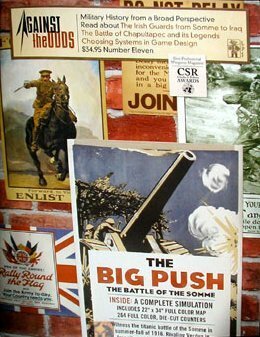 ATO magazine game Nr.11 "The Big Push": the major British offensive in the Somme river area, together with their French comrades, July to November 1916. We played the 4-turns scenario "Over the Top" as a learning exercise. It took some time to get used to the game system at the first place. So we were just barely able to finish 3 turns in 5 hours. A bit slower than I expected, primarily because, I think, of Roger Nord's usual approach of introducing as many variables as possible into his integrated design. A lot of different die-roll modifiers have to be accounted for and calculated at the time of resolving combats. Otherwise, we were pretty much happy with the game's neat treatment of command resources, where the British have more options than the Germans at the Corps strategic planning level. One thing we tried to figure out initially was the use of the HQ for both movement and combat. It is because an HQ in command range and in command mode should be there for assault commitments. At the same time, they should be in supply mode when actual combat takes place to avoid that nasty +2 DRM. Soon, naturally we knew that the Brits had the advantage in the number of HQs available! One HQ would allow the Tommies to get close to assault. Another HQ would supply them in combat. Speaking of assaults, we were confused between assault, which is a normal one, and close assault. In the latter, defensive fire fire occurs before the attacker fires. While close assault has a +1 DRM for EACH close assaulting unit to inflict greater damage, we forgot to apply this one. We had all defenders getting to fire first in a normal assault . . . I would have hoped that the rules for assault should have clearly stated this, not only just a DRM description on the Assault Results Table. The Brits could have pushed the German back more. At the same time, since we played it incorrectly on the close assault rule, there was no point for the German to go over the top for a close assault, given the fairly bloody combat results for the attacker. So the result is a false victory to the Germans . . . as the Allied could not clear all the German units from the starting trench line. Actually, despite rain-clear-drizzle weather, the Brits had done well in the centre part of the Somme River, breaking through the German line, with their cavalry advancing into the trenches once vacated by the defenders. The process of Artillery bombardment is more efficient than that found in To the Green Fields Beyond, with lifting and creeping barrages being the command resources for the Allied to use. There are no tanks in this scenario, so we didn't get to see the tank breakdown. Replacement is calculated by counting the number of assault steps lost and disordered units. Most Allied units have 4-steps and the Germans have 3. Victory points would go to the opposing side for each step replaced. Since the Allied victory conditions hinge on territorial objectives and not VPs, it is almost a wild spree for the German to get the replacements up and running and sending 'em to the front via roads as soon as possible. Overall, we liked the game system. The number of units and low stacking limit on the one map is very manageable and we got used to movement on the square map grid (a very nice one by Craig Grando) without problem. The treatment of counter-battery fire is also fun. There are 4 shorter scenarios (4 to 7 turns each) to choose from, dissecting each segment in the campaign very well. Along with the 21-turn campaign game, we will definitely give it another spin sometime soon. Four battles of Warhammer Ancient Battles were completed and, although we found that we had made many mistakes in the games we had played before, all participants enjoyed this interesting battle system simulation. Let everybody study their mistakes so as to become familiar with the system. As noted before, the game play was very fast with the four 1500 points battles being completed within five and half hours. Game 1: Rome (Hermann Ng) vs Barbarian (Christopher Chu). This was definitely very intense, as the sides had been matched against each other many times before, thereby both understanding their enemy's merits and shortcomings. The Roman force fielded its “Tormenta”, a small stone thrower, giving battle for the first time and causing lots of casualties to the Barbarians. At the start, Warlord Chu, unceasingly prompted his warbands forward, but Centurion Herman preserved his legionaries by adopting the “Testoudo” formation, this tactic giving Rome the superior position. On the right flank, the Roman Cataphracts routed 2 units of Barbarian light cavalry. However, on the Roman left wing, a legion was broken in hand-to-hand fighting when 2 warbands attacked, precipitating continuous panic tests of other nearby Roman units, all of which failed. Defeat to Centurion Herman , with a clear victory for the Barbarians. Game 2: Macedonian (Philip Ngo) vs Early Imperial Rome (Alex Lam). An ahistorical scenario but still interesting to play. Centurion Lam attempted to arrange the Roman armed force in a different kind of formation; he put the Roman legionaries into two ranks to increase the effect of the pilum in the close combat. The result gave the Roman armed force a pleasant surprise, defeating a unit of 24 Phalangites & killing Alexander the Great with his Companion Cavalry. Without doubt, a Roman victory. Game 3: Hundred Years War English (Cheung Kar Fai ) vs Hundred Years War French (Hermann Ng). They recreated a battle of one of the greatest conflicts of the Medieval Age, with the Warhammer Ancient Battles supplement, Armies of Chivalry, in 15 mm scales, all figures being provided by Kar Fai. Although England ’s longbow men shot down a lot of the French dismounted knights and hand-gunners, they English still lost the battle because they could not stop the fierce charge of the French knights. Game 4: Macedonian (Christopher Chu) vs Barbarian (Hermann Ng). The Macedonians won by making a successful charge against the Barbarian warbands with their Thessaly Cavalry. Moreover Chu had extremely good luck in this battle, killing 6 barbarians with only 10 attacks. Hermann tried to outflank with the light cavalry & chariots but was hindered by the terrain, ultimately being unable to fulfill his plan. Two battles of Bosworth 1485 being fought to conclusion using Tony Mathews superbly painted 28mm War of the Roses figures (when are you going to flock those bases Tony?). The first battle saw a historical defeat of Richard III (Tony) and his brothers in arms, Northumberland (Derek Townshend) and Norfolk (Andrzej) at the hands of Henry (Eric), Pembroke (Peter Munn) and Oxford (Ken), with wily old Stanley (Jeff) sitting on the hill and never joining the battle. In the second round, players switched sides with Jeff taking over as Richard and Ken sitting on the sidelines as Stanley. This time the Yorkists carried the day, although Richard fell in battle at the hand of the Tudors, shortly after Stanley had thrown his lot in with the Lancastrians. The hard fought battle of Salamanca, in 15mm, with the Allies eventually carrying the day after some fierce fighting in the centre. Participants were Lawrence Ho and Glenn Haley as the Allies, and James Cheung and Lee Tai Wah as the French.